The creation of the Battle Proms came from a desire to make best use of the 200 live firing replica Napoleonic cannon that were taking up a lot of room in the yards of the English Field Artillery Company. The only sensible use for this amount of guns was to perform Beethoven’s 'Battle Symphony'* as he intended, with 193 live firing cannon providing a thunderous percussion! It is this signature piece which gives the Battle Proms its name and lends a unique and spectacular twist to all Battle Proms concerts. The cannons also feature in the 1812 Overture (a mere first half finale at the Battle Proms!) and provide a stunning backdrop to all the panoramic concerts. Over the last 19 years the Battle Proms team has worked hard to ensure that they provide the most truly memorable Proms in the Park style events set in the most spectacular locations. The result is a picnic concert series featuring an uplifting orchestral programme of sublime classical music, and additional acts and attractions to ensure a jam packed summers afternoon and evening for all. Burghley House in Lincolnshire is simply beautiful and the Battle Proms concert takes place from an elevated position overlooking the grand Elizabethan architecture, giving Battle Promenaders a stunning view of this 16th century stately home. Blenheim Palace in Oxfordshire was the birthplace of Sir Winston Churchill and is now a World Heritage Site. A hugely popular venue for a number of attractions this is one of our most popular sites for overseas visitors. Hatfield House in Hertfordshire is said to be where the young Queen Elizabeth heard the news of her sister Mary’s death and her accession to the English throne. It is in the beautiful, leafy surrounds of the Queen Elizabeth Oak Field that the Battle Proms takes place. Highclere Castle in Berkshire, now world famous as Downton Abbey, Highclere Castle first hosted the Battle Proms in 2001, making it one of our longest running venues alongside Hatfield House. The Battle Proms take place on the lawns directly in front of the castle affording wonderful views of this now iconic building. Ragley Hall in Warwickshire offers a unique twist on the Battle Proms experience. 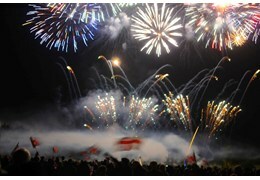 The concert itself takes place by the lake, creating dramatic and breathtaking pyrotechnic effects with the cannon fire and fireworks for which the Battle Proms have become famous. Please visit www.elliesfriends.org/freebies to see the dates available and to apply.